Perhaps it was inevitable that if the machine gets to tell the story, in the end it becomes the story. And if it has to pay big money to tell the story, then it is going to want a captive audience. And the more it pays, the bigger the audience it will want in return. Last week, television's long, creeping colonisation of high-end football moved another step closer to a land-grab. Like a crowd that has surrounded a pitch on all four sides, encroachment onto the field was bound to happen, sure as night follows day. Manchester United's match with Paris Saint-Germain at the Parc des Princes was ultimately decided by the all-seeing eye of the cameras. These mute machines that record everything with inscrutable indifference are starting to mutate from passive to active players in our sporting universe. It is perhaps another foreshadowing of technology ascendant, the long-promised rise of artificial intelligence and its gathering influence in the affairs of man. In real time, during the flesh-and-blood struggle for supremacy of two football teams, a Portuguese player for United named Diogo Dalot tried a shot at goal that was blocked by a French defender, Presnel Kimpembe. It was the 90th minute of the second leg of this Champions League round of 16 tie. United needed one more goal to go through. The ball ricocheted high and wide for a corner. Dalot appealed to the referee, pointing to his arm, suggesting a handball offence in the penalty area. Nobody else appealed because nobody else saw anything untoward; it was a blink-of-the-eye moment. A United player hurried over to take the corner-kick. He placed the ball in the quadrant, but the linesman was already there in his face; he stood in front of the ball, preventing it from being kicked. Presumably he'd received word in his earpiece that the video assistant referee was reviewing the incident remotely. Out of the blue, as in a Greek drama, a deus ex machina was descending to decide the outcome of the tale. 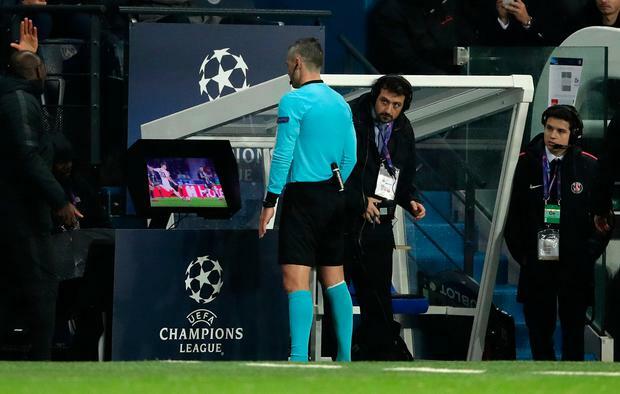 Some 40 seconds after Dalot's shot, the Slovenian referee, Damir Skomina, received word in his earpiece from the VAR team that he needed to watch the footage for himself. He jogged over to the television booth stationed between the two team dugouts. He watched multiple repeats of the micro-replay showing the ball glancing off the point of Kimpembe's elbow; he watched freeze-frames of the ball contacting the elbow; he watched super-slow-motion replays of Dalot taking the shot, Kimpembe turning his back and jumping and the ball deflecting; he watched a wider, higher angle that reduced the players to Subbuteo size but showed that Kimpembe was just inside the box. But the box that mattered was the one not on the field. Having spent some 55 seconds watching television, Skomina turned around, jogged back onto the pitch and blew his whistle. He mimed the 'square' shape with his hands to indicate that after consulting with VAR he'd arrived at a decision: penalty. He pointed to the spot; Kimpembe bent over in dismay, his head in his hands; a shockwave tremored through the crowd. Marcus Rashford, who'd looked as if he was frozen by stage fright in the first half, nailed the penalty. This sequence of events was the moment when virtual reality intersected with actuality; when television broke the fourth wall; when the video game perforated the human plane and intruded upon the real world. Multiple slow-motion replays in hyper close-up will capture the facts but not necessarily the truth. They are a form of augmented reality. Watch them often enough and they become a wormhole, a simulated version of organic events that have happened in real time. Skomina entered the virtual world to find a definitive version of what had happened in the real world. Natural justice told us with every fibre of our lived experience as followers of the game that this was the wrong call. More than one hundred years of communal knowledge accumulated by a global audience over generations had conditioned us to believing that a defender putting his body in the way of a fierce shot has earned the benefit of the doubt in such circumstances. Short of chopping his arms off, where is he supposed to put them? But the technology, with its hydra-headed multiplicity of cameras, is all the time gathering the data and feeding it into the mainframe and regurgitating it not as evidence, but verdict. In attempting to rid itself of the manifold embarrassments that come with human error, Big Football is deferring to the omnivision of the TV Cyclops and confusing it with omniscience. The problem, as with all surveillance, is that it offers seductive solutions. VAR can rescue a team and a player from injustice; it can confirm the offside, the foul in the penalty area, the ball that has crossed the line. We are all prepared to sacrifice a measure of our human autonomy for a little Orwellian supervision if it provides us with the comfort blanket of hard evidence, a sense of security against the random mistakes and misdemeanours of people. But while the offside question usually comes with an empirical resolution in replay, a handball incident such as this is still subject to that old benighted chestnut that is the referee's interpretation. In this grey and nebulous dimension, the multiple frame-by-frame replays may serve only to distort what actually happened. But as far as the television companies are concerned, the more VAR the merrier. It puts them at the centre of the drama. They are no longer recorders but players, no longer the frame but the picture. They are the cuckoo in the nest built by others. Last Wednesday night in Paris, Dalot and Kimpembe were ostensibly the featured actors in the climax of this riveting plot; but they ended up the bit-part players in a production that was way beyond their control.